OMA founder Rem Koolhaas says ZHA can continue to grow after the death of its founder Zaha Hadid if it follows the model used by leading fashion houses. In an interview with UK website BDonline, Dutch architect Koolhaas said that companies like Alexander McQueen and Chanel could offer a precedent for architecture firms that lose a figurehead of Hadid's status. "I think there is a model these days where fashion houses survive by working on the DNA of their founders," he said. "It is a model that is becoming more and more current and it could work in architecture too, I think." British fashion house Alexander McQueen lost its founder in 2010, but has continued to realise designs that honour McQueen's dark but romantic style. The brand is now led by Sarah Burton, who was McQueen's right-hand woman. The fashion designer has also been extensively eulogised since his death, with a blockbuster exhibition at New York's Metropolitan Museum of Art and the V&A museum in London. Another example is Chanel, where Karl Lagerfeld has evolved Coco Chanel's original vision for modern femininity since 1983, adding his own irreverent spin to the fashion house that has helped it become one of the world's most-recognised brands. Zaha Hadid Architects, or ZHA, has pledged to continue the work of its founder Zaha Hadid, who died unexpectedly in March at the age of 65 after a heart attack. It will see through all of the projects that the firm was already working on, as well as taking on new work under the leadership of Patrik Schumacher, who was Hadid's long-term business partner and collaborator. Koolhaas explained that his firm had been increasingly crediting individual partners for projects to build their profile as part of its own succession plan. "We are a partnership with nine partners each with their own individuality and talents, and that is increasingly recognised and also promoted by the company in terms of crediting partners individually for the work they are doing," he said. OMA's partners include Reinier de Graaf, who led the development and restoration of the former Commonwealth Institute in London, including three blocks of apartments that helped pay for the listed building to be turned into the new home for the Design Museum. De Graaf also oversees AMO, the firm's research arm, which works extensively with fashion house Prada. In January, AMO designed and built a full-scale theatre set for Prada's Autumn Winter 2016 fashion show. Shohei Shigematsu is another partner who has become more visible recently, after running OMA's New York office for 10 years. His recent projects include the design of the Manus x Machina fashion exhibition at the Metropolitan Museum of Art, the renovation of artist Cai Guo-Qiang's Manhattan studio, and plans for the firm's first skyscraper in Tokyo. Koolhaas made the comments after opening the British Council of Offices conference in Amsterdam. According to BDonline, the conference was dominated by talk of Brexit. Koolhaas is among those who believe the UK should stay in the EU. "The whole idea to question it is really crazy," he said, adding that OMA would be launching a series of interviews next month with Europeans to address the future of the EU. 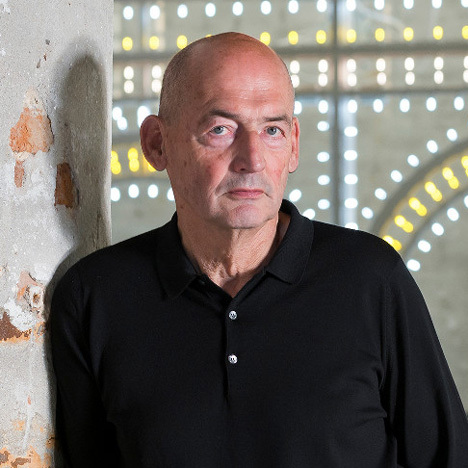 "We are extremely well known as strong advocates of Europe," said Koolhaas. German photographer Wolfgang Tillmans also recently designed a range of posters to encourage UK residents to vote to stay in the European Union, after branding the official Remain campaign "lame".